Riddle me this: can mayhem be controlled? Can it be curbed? Prevented? Even eradicated … or is the world just too damn big to exist without atrocity? Earlier this week, I attended a screening of Girl Rising. The movie tells the stories of nine girls from different parts of the world who face arranged marriages, child slavery, and other heartbreaking injustices… Despite these obstacles, the brave girls offer hope and inspiration. By getting an education, they’re able to break barriers and create change – this brief synopsis provided by Seventeen Magazine. But. Like Girl Rising suggests, something has to be done. 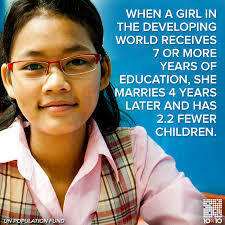 We cannot afford to ignore the inequality placed on girl’s lives in certain parts of the world. But what can we do? Realistically, what can we do? Adopt all the unwanted and undervalued lives? Secretly put birth control in the water and put an end to conception where young girls are tossed aside like garbage? No. Of course not. That would be too Aldous Huxley for the conscious. To watch a trailer and learn more about the movie, Google Girl Rising, or go to this direct link: http://girlrising.com/ AND, if you do see the movie, let’s talk … I really am curious to know what people think! Previous Tell yourself Duckie, you’re really quite lucky! Like Mortensen’s “Three Cups Of Tea” I too think education is the answer. “Girl Rising” reminds us that educating the girls of the world is the quickest way to change the world. Educating millions of women and girls in horrific circumstances is a daunting task, impossible, no. Many will not be saved, many will be saved. I think of my daughter and hope that in similar circumstances she would be the lucky one to receive an education. Great review, could not agree with you more.